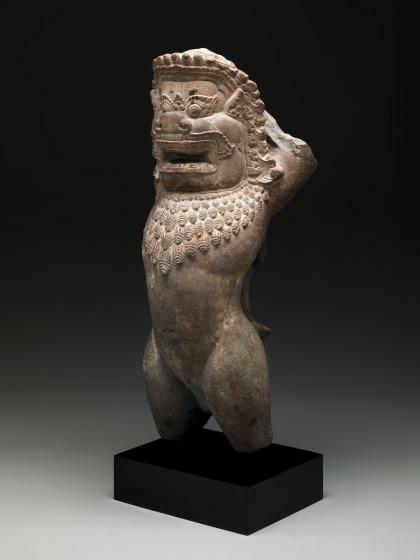 This rearing man-lion exemplifies the monstrous guardian figure in South Asian art. 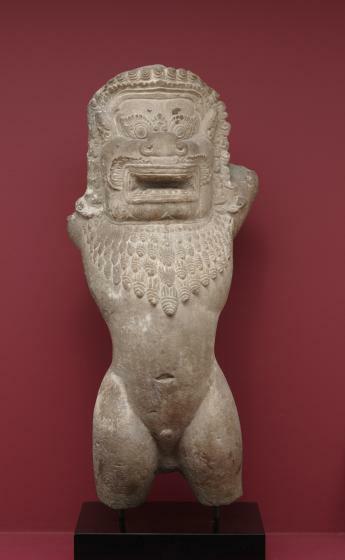 It likely comes from Jayavarman IV's capital at Lingapura located in present-day Cambodia, now known as Koh Ker. 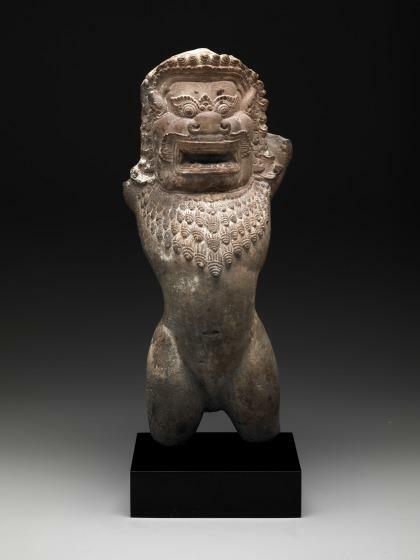 Although lions were not indigenous to Southeast Asia, they acquired symbolic significance and were an important element in Hindu and Buddhist art. The sculpture's dynamism and sense of physical power, apparent despite its lost limbs, exemplifies the style of Koh Ker sculpture. Staring eyes, flared nostrils, and a powerful jaw all emphasize the lion's ferocity, while its torso is muscled and almost humanoid. During the first millennium BCE, the Persians associated the lion with royalty. During the third century BCE the great Buddhist king Ashoka brought the regal symbolism of lions to India. Within the context of Buddhism, the lion had a further meaning, as the historical Buddha, Shakyamuni, was of the lion (shakya) clan. The association with royalty and recognition of the lion's great strength were valued characteristics invoked in the lion's representation on both temples and palaces, where the figure acquired an auspicious significance. As guardians of the earliest Khmer temples, freestanding lions demarcated sacred ground. Elsewhere in Southeast Asia, in Indonesia and in central and south Vietnam, supporting lions often decorated the exterior base of temples. Yet their depictions were not limited to the grounds or exterior of a temple, as carvings of lions are seen on lintels, thrones, and pedestals or platforms. 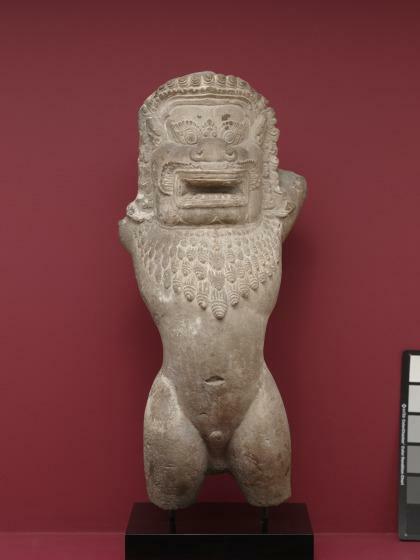 The breakage at the back of this lion and his upraised front legs indicate that he functioned as a decorative support, quite probably holding up a pedestal. A number of elaborately decorated pedestals or platforms with lions of a similar style have been discovered at the extensive site of Koh Ker. Earlier pedestals do not include lions in their decor, while pedestals seem not to have been produced in the later period. The details of the face further associate this lion with the royal temple of Koh Ker. 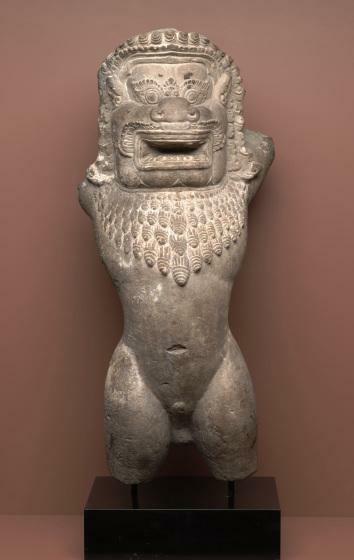 The squared-off mouth and the treatment of the eyebrows with the motif between the eyes are akin to lions at Koh Ker as well as to other sculptures of the 10th century, such as the kirtimukha (face of glory) and lions from the small, privately dedicated temple of Banteay Srei. Nancy Tingley, "Rearing Lion," in The Arts of India, South East Asia, and the Himalayas, Anne R. Bromberg (Dallas: Dallas Museum of Art; New Haven: Yale University Press, 2013), 214. Emma C. Bunker and Douglas Latchford, Adoration and Glory: the golden age of Khmer art. Chicago: Art Media Resources, 2003.